Tight on time? Stick with the 3 Key Takeaways and The Basics. These will provide your athletes with a solid foundation for understanding respect. 1) admiring (someone or something) deeply, as a result of their abilities, qualities, or achievements. 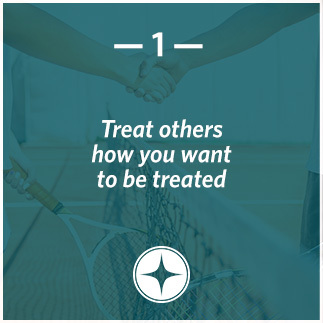 These two go hand-in-hand, but more simply, respect means treating others how you would want to be treated. It also means practicing self-respect by being accountable for your own actions and attitudes. In athletics, this can sometimes be a tough thing to do. 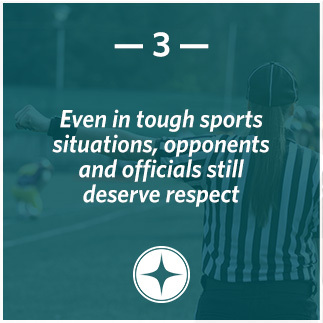 But even in the heat of competition, it’s important to continue to show respect to opponents, coaches, teammates, and officials. Being respectful of everyone (including yourself) makes it more likely that others will respect you back in return. 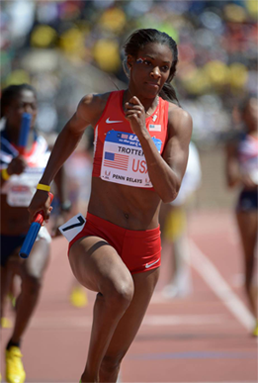 Track and field Olympic gold medalist DeeDee Trotter remembers a time early in her career when she was distracted before a race. Instead of focusing on the event and mentally preparing herself, DeeDee was socializing with her friends. When she began to run just before the starting gun fired, she was penalized for a false start. She remembers feeling embarrassed, but blamed others—the starter, her teammates, her coach, and even her mother—for her mistake. However, after some thought, DeeDee soon realized that this was disrespectful behavior and that she was avoiding acknowledging who was truly at fault: herself. Had she respected herself and the race by focusing on the task at hand instead of her friends, she would’ve been better prepared to run well. From this experience, DeeDee learned to respect herself and others, a lesson that helped make her the Olympic champion she is today. In 11 years of competition, DeeDee is proud to say she has never false started in a race again since then. TrueSport athletes like DeeDee always stay treat themselves, others, and their craft with respect, even when it doesn’t seem easy. 1. What was the main point you took away from the lesson’s message? 2. Like DeeDee, have you ever learned a life lesson from a similar experience? 3. How can you practice being more respectful in sports this week? Use this 15-minute activity includes guided discussions to get your athletes thinking and talking about respect. Celebrate your groups’ completion of the lesson on Respect with this special TrueSport Certificate handout.